Supported by Cultural Center of the Philippines (CCP), Warehouse Eight together with Kwago organized the first experience-driven book fair that features different ways to tell a story on November 18, 2017 at Warehouse Eight, La Fuerza compound, Makati City. Artists Asch, Lions and Acrobats, Niki Colet, Alyana Lea Carmela, and Hoochie Coochie Mikkie bare their insides through music at Echoes at the Warehouse. Chibot Media set up a Virtual Reality (VR) booth and introduced book lovers to a new form of storytelling. Exesanonymous.com made an award-winning play come alive. Zine artists and independent publishers showed the beauty of experimentation and of exploring new methods of presenting a narrative in print to enrich the experience of readers. With an aim to be a literary respite, an escape from reality, Komura; book fair focused on letting people experience literature because schools gave it a bad reputation by always associating reading with amassing information—textbooks, not with happiness and imagination. “I grew up reading because it’s required, because my teachers told me that it will make me smart and successful. It was mostly functional. My goal now is to show people that literature could also be a source of pleasure, relieve stress, deepen empathy and enrich creativity,” Komura; co-founder Czyka Tumaliuan said. “Literature is so much more than a learning platform. Literature is an EXPERIENCE,” she added. 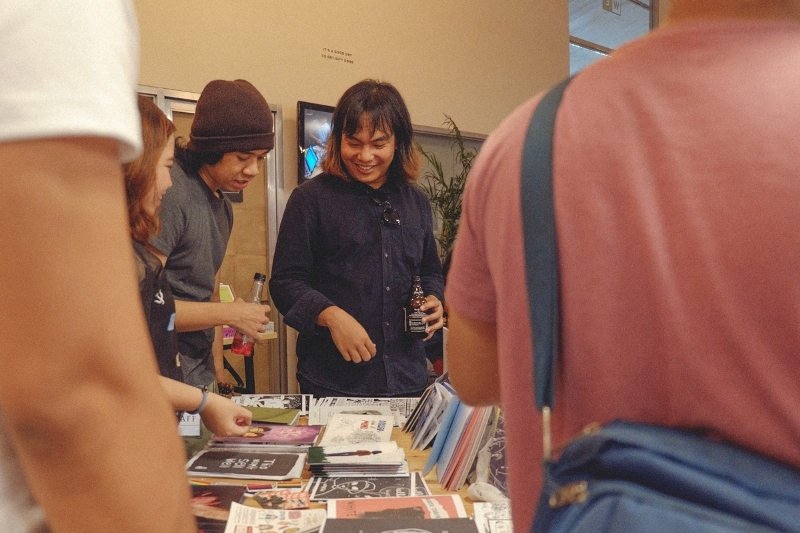 Komura; is also the first book fair in Manila that gathered independent and specialty bookstores, publishers, and art shops in one intimate space to celebrate creative freedom, reading and the DIY culture. “We wanted to design a fair that would not only be a treat for our guests, but also for our vendors. We want everyone to have a good time,” Komura; co-founder and Warehouse Eight co-owner Kayla Dionisio shared. “With the help of Jia Cabansag, we designed the Warehouse in such a way that people would want to stay and chill for a bit. We wanted everyone to feel at home. And I’m so happy to see that they did. I even saw a guy half-finishing a book he just bought that day. Children and old couples were reading in the nooks we intentionally scattered in the space. I really felt that Komura; revived a lost art form—reading,” she added. Hopefully, Komura; happens again next year.